The main rooms of the apartment or house may be comfortable or strict, bright or monochrome. 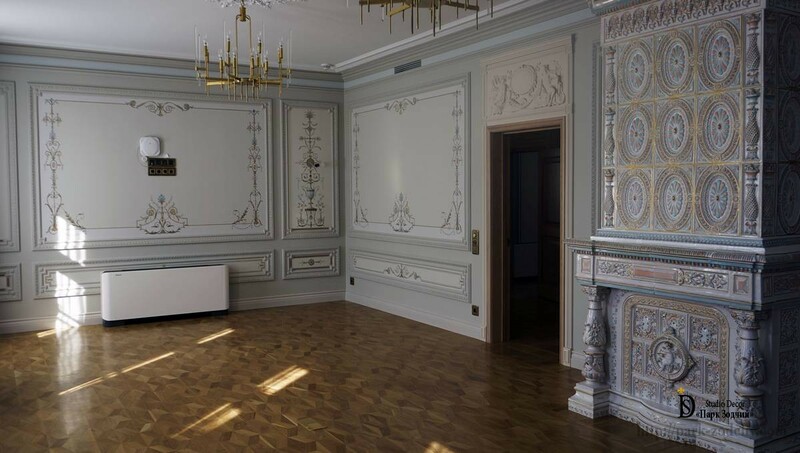 To decorate the living room combination of various decor has been chosen: ornamental grisaille, glazed tiles, exclusive lamps and inlaid parquet floors. As a result, the Interior has acquired the palatial luxury. The design of the Interior cannot be called vivid. There is no stucco molding, covered with gold leaf, bright panoramic painting. For the décor, the discreet, as if aged for centuries, color palette has been chosen. This is what has made it elegant and memorable. 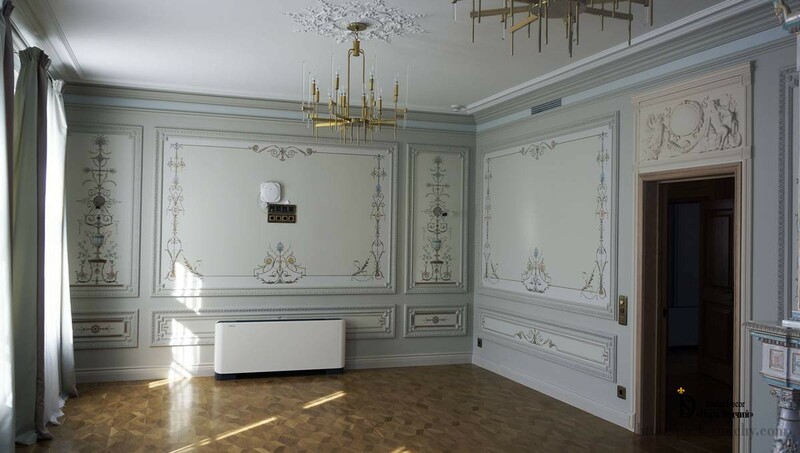 Classic finishing options have been used: painting, architectural mirrors, stucco moldings, mosaic parquet. 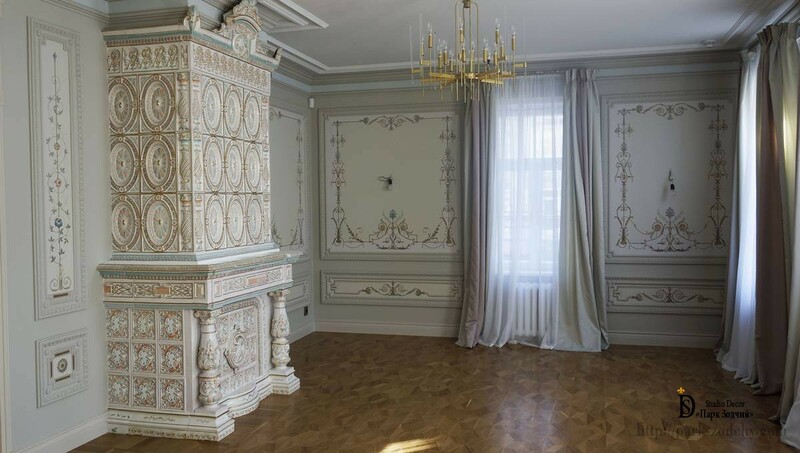 The stove decorated with exclusive, unique-for-beauty glazed tiles has become the real ornament of the room. It exactly is the basic element, around which it has been taken advantage of the interior decoration in general. Light tones of the background, ornamental grisaille in the architectural mirrors have given the room a solemn and sophisticated look. Graceful pattern is used if it is necessary to give the Interior weightlessness, but alongside with this, the premises turn into a palace hall. Small details do not overload the living room, but create a mysterious ornamental pattern on the walls. An interesting technique has been used to visually make the room higher. The upper part of the wall is dyed in a brighter tone, due to which broad friezes imaginatively “soar” and raise the ceiling. 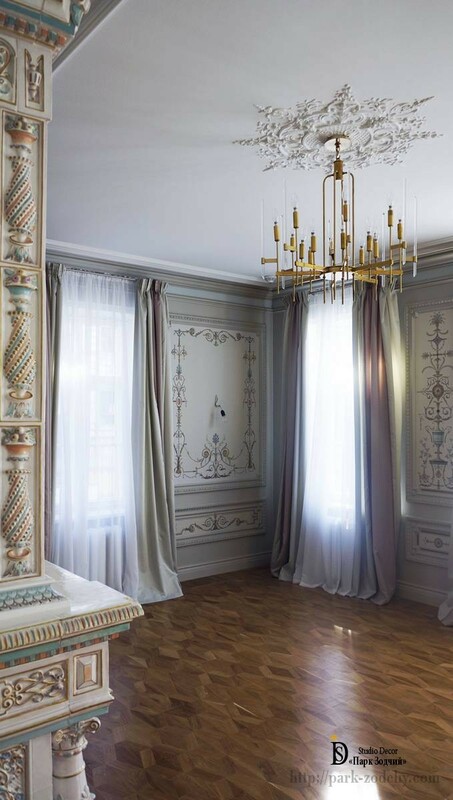 Decorative string cornices frame the architectural mirrors. Weightless decor has become a wonderful backdrop for the furniture. 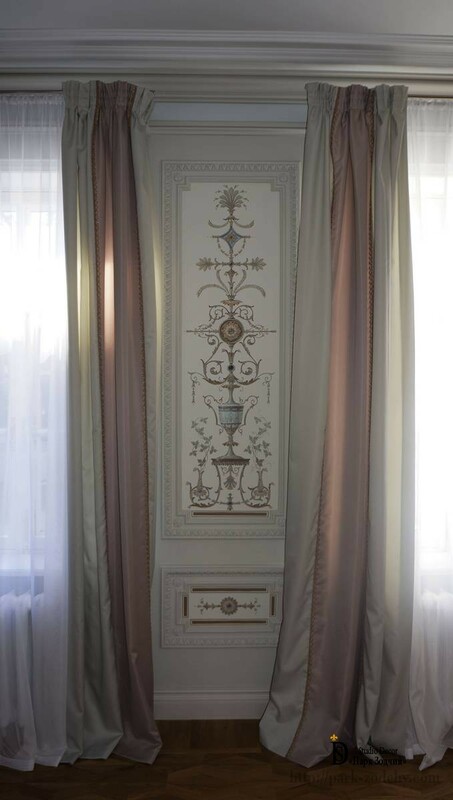 Dessus de Porte (decorative gypsum composition above the door) corresponds to the overall decoration theme and visually balances the sizes of doors and the Regal Interior. Non-standard pattern of parquet board has been chosen for the room and become the additional ornament of the room. Stucco moldings of the ceiling has been made so skillfully that creates a feeling of lace ornament scattered around the light fixtures. Chandeliers of strict form are interesting in their own way, they are not dominant, and emphasize the elegancy and lightness of the Interior. To create airiness, massive portieres and lambrequins have been abandoned, due to this, windows do not obscure to feast eyes on the walls finishing.